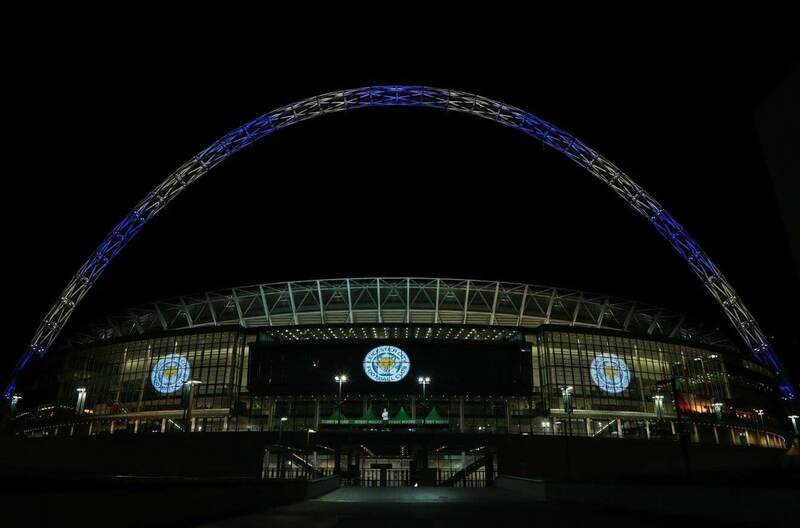 Wembley stadium was lit up in the colours of Leicester City last night in memory of those lost in Saturday night's helicopter accident. The national stadium, which narrowly escaped being sold recently, bore numerous images of the Leicester City crest whilst the famous arch was coloured blue and white, in memory of City Chairman Vichai Srivaddhanaprabha and the four others killed when the helicopter plummeted to the ground seconds after take off. The accident is believed to have occured due to a problem with the AW169 helicopter's tail rotor, which caused the aircraft to enter a deathly spin. According to aviation experts, technical failure of this particular nature is one of the most difficult to recover from - largely as a result of the disorientating effect felt by the pilot/s. In addition to pilot Eric Swaffer, his partner Izabela Roza Lechowicz - who was also on board - is understood to be a trained fixed-wing pilot, although experts maintain that this would have made little difference in the circumstances. The accident mirrors an incident that occurred in Madrid 13 years ago when Spanish opposition leader Mariano Rajoy and the head of Madrid's regional government, Esperanza Aguirre, were invovled in an almost identical crash upon leaving a bullfighting arena. Fortunately, on this particular occasion, all passengers walked free.